Thank you for reviewing this. It was so awful and horrible to watch. I sent a complaint. An excellent interview by Maitlis, unfortunately for Regev his lies are unravelling. The massacre of children, the seven year blockade, the reckless way in which the IDF have been firing at civilians. Are all BBC correspondents bound by contract to use HardTalk rules where they insist on the answer they want interrupting, not listening to unwelcome answers, insisting in the way that would get any child sent from the room? Time to grow up BBC and talk to your interviewees as if they were human and not just Israelis. The leader of Hamas, Khaled Meshaal, has said the group wants a truce as soon as possible, but with a genuine guarantee to lift the eight-year long siege. In an exclusive interview with the BBC’s HARDtalk programme, Mr Meshaal said that Palestinians in Gaza wanted to live without the Israeli and Egyptian blockade and open up to the world. He said the people of Gaza were “being punished with a slow death in the world’s biggest prison”. He said: “We are eager that the bloodshed should end in Gaza”. 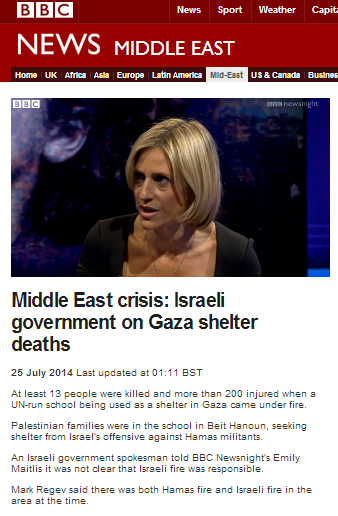 Yes, Emily Maitlis seems to really resent the fact that more Israelies aren’t dying. It is really too terrible that Israel protects its citizens. A matter of taste? I submit that it isn’t. The BBC’s blatant antisemitism is a matter of demonstrated fact. Don’t forget the UNRWA – given its account of what happened, it must be a lying, anti-semitic organisation too, i suppose. In fact you could argue – given that Arabs are semites, just like Jews – that the most lethally antisemitic institutions on the planet are the Israeli and US governments. Wow, this isn’t an interview or even an interrogation. She’s using him as a prop for her anti-Israel diatribe, not letting him answer questions. Absolutely disgraceful excuse for journalism. I read that at least one rocket was misfired by Gazans ontothissite. One question she repeated which was a parody of ‘when did you stop beating your wife’ was “so you knew that women and children were in the school when you shelled it, didn’t you?” I was was shouting out at the TV screen that Hamas certainly knew it when they engaged in battle with Israeli troops right outside the school. The deaths of children “tediously parochial!” Yes,when they’re Palestinians. Look, there’s actually an ethical tradition in Judaism which should ensure the protection of the stranger within your gates. Israel has forgotten it, and some of the attitudes to Gazan children currently voiced in Israel are reminiscent of a much nastier regime in the last century.